We measure and mitigate hidden thinking. We provide the only tool that measures hidden thinking in senior executives. We do this using a proprietary on line survey of senior leaders’ cognitive biases. Cognitive biases corrupt thinking, and are particularly dangerous when executives are thinking about the future. They are also insidious – as well as affecting individuals, they affect teams – who tend to form group biases as they work together. Our Cognitive Bias Test measures both the individual biases of your executives, and the biases they have when they work together as a team. We also certify accredited facilitators in the Cognitive Bias Test. Accredited facilitators are trained to provide workshops that help your executives understand the biases that they have, and then develop concrete tools to mitigate them. Book a call for the full report. 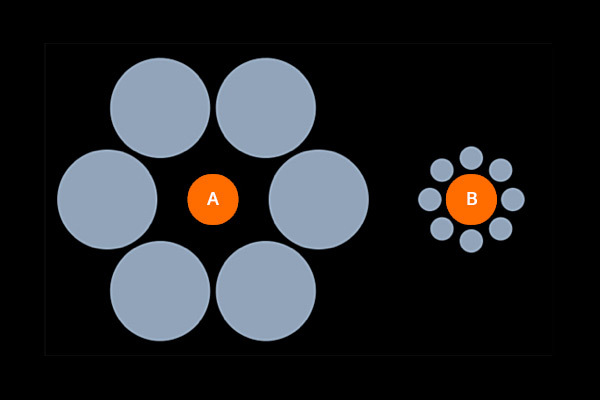 » Which orange dot is bigger? Cognitive biases allow for fast decisions with the least mental effort. They can be useful when making immediate, tactical decisions, yet are almost invariably a hindrance when making strategic decisions. Why? There are nearly 150 recognised cognitive biases. The original approach to measuring them in individuals involved eight weeks’ observation over a prolonged series of simulations. Awareness of cognitive biases (see measuring cognitive biases) is the first step. The next step is to have concrete tools to reduce the effects of these biases on our thinking. By far the best way to help a senior leadership team to understand and mitigate their cognitive biases is through off-site workshops, conducted by qualified CBT facilitators. The following are useful links, when researching cognitive biases.